This power working in us is the same as the mighty strength which he used when he raised Christ from death and seated him at his right side in the heavenly world Christ rules there above all heavenly rulers, authorities, powers, and lords; he has a title superior to all titles of authority in this world and in the next. God put all things under Christ's feet and gave him to the church as supreme Lord over all things. Tom walked home from school and it seemed that one of the older boys had it in for Tom. It was probably because Tom was small for his age that he was easy to pick on. The older boy would wait behind the bus shelter for Tom. Everyday after school was a nightmare. Then one day a new kid came to school and sat next to him in class. Soon they were good mates. After school Tom caught up with his new friend and found that he lived near his place and so they walked together. As they walked past the bus shelter Tom became aware that even though the kid who picked on him was there, he didn’t make any attempt to bother Tom. And Tom knew why. It was his new friend walking beside him who was a lot bigger than both Tom and the boy who bothered him every day. He was no longer afraid. Jesus is the one who walks with us coming between us and the evil that would want to harm us. Paul makes no bones about the fact that there are mighty, powerful forces out there that have got it in for us, and would bully us into a sense of fear and failure. Satan will do his best to get us away from trusting Jesus and following God's ways. He will trick us into believing that we don’t need Jesus walking with us along life’s journey. We can do quite all right by ourselves, thank you very much. He will convince us that we can exercise our rights regardless of how that might affect other people. My needs and wants are more important than anything else. Satan will do his utmost to make us lazy Christians. He doesn’t mind if we say we follow Jesus so long as we don’t do anything. By all means say you are a Christian but really the Bible, the church, faith, worship, working together with fellow Christians aren’t all that important. He even manipulates us using the weaknesses in our human nature to trick us into doing really shameful things. Paul puts it this way. "For we are not fighting against human beings but against the wicked spiritual forces in the heavenly world, the rulers, authorities, and cosmic powers of this dark age" (Ephesians 6:12). Paul isn’t overstating the case here. Satan and the evil forces at work in us and in the world around us are powerful and by ourselves we don't stand a chance. Peter isn’t exaggerating when he says, "Be alert, be on watch! Your enemy, the Devil, roams around like a roaring lion, looking for someone to devour" (1 Peter 5:8). Perhaps Peter is recalling the time he had been devoured by this prowling lion. He had declared so confidently at the Last Supper that he would follow Jesus even to dying for him and then just a few hours later denying to all around him that he doesn’t even know Jesus. Or perhaps he remembered Jesus’ words in the Garden of Gethsemane when Jesus said, "Keep watch and pray that you will not fall into temptation. The spirit is willing, but the flesh is weak" and all Peter could do was sleep. Satan will not only cause trouble in our lives but he will use whatever means he can to cause us to abandon God and question his love for us. Sickness, death, tragedy, trouble, conflict on a personal and international level, natural disasters like floods, fires, tsunamis and so on, are all part of life in the broken world that we live in. Satan uses every one of them to terrify us, to make us feel that we are all alone in the middle of any of these and that no one cares what happens to us. He will use these to drive a wedge between us and Jesus to the point where our confidence in Jesus is undermined and we abandon our trust in him. Don’t think, "This can never happen to me". Don’t underestimate Satan’s ability to attack us with doubts and fear; stir within us lust, pride and hatred; assault our bodies with disease, pain and death. He is persistent and doesn’t give up easily. However, in spite of the almost overwhelming power of evil around us and the many times that we are overcome by the havoc that evil causes in our lives, the New Testament states that the power of evil has been defeated. We read in simple straightforward words, "The Son of God appeared for this very reason, to destroy what the Devil had done" (1 John 3:8). And we heard in the reading from Ephesians, "Christ rules above all heavenly rulers, authorities, powers, and lords; he has a title superior to all titles of authority in this world and in the next". Today we celebrate Jesus’ ascension to heaven where he sits at the right hand of God the Father and rules with all power and authority. There is nothing or no one more powerful than he is. He is ruler and lord over all things. At our baptism, we became members of God’s kingdom. The ascended Jesus is our Lord and King. We are God’s own people. We live under the lordship of Jesus. In order to destroy the power of evil, Jesus himself had to face evil head on. This he did on the cross. The power of Satan to separate us from God and his love was broken. The power of sin to damn us to hell was broken. We are forgiven. We are restored, redeemed, renewed, and revived with a new life and a new relationship with our Maker. To describe this victory of the cross Paul uses a picture of a general leading his enemy in a victory procession through the streets. By doing this he was making a public statement that he has stripped all power from his enemies. Paul wrote, "At the cross Christ defeated all powers and forces. He let the whole world see them being led away as prisoners when he celebrated his victory" (Colossians 2:15 CEV). That’s what our King and Saviour did for us. 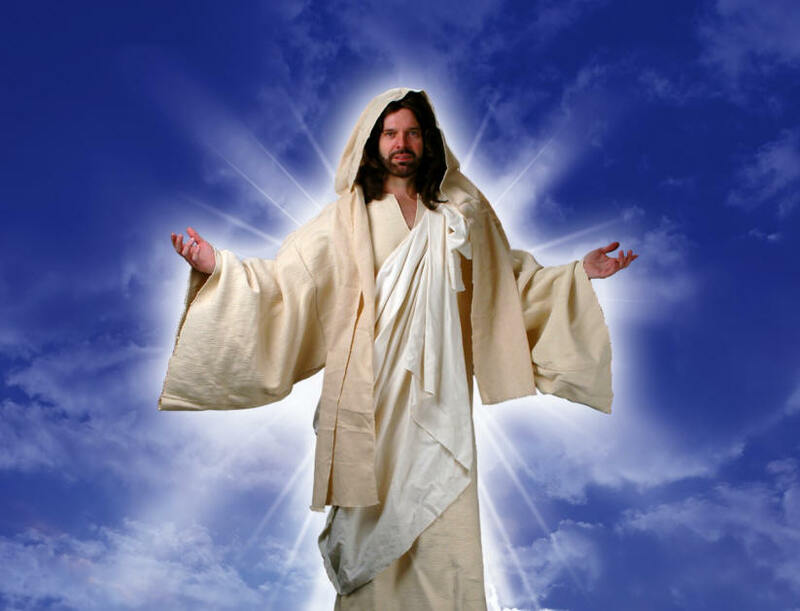 Jesus ascended to heaven as Lord of lords and King of kings. But just because he ascended to heaven doesn’t mean that he has left us now to fend for ourselves in the fight against evil. He ascended so that he could be the ever and always present God. Wherever we go on this earth and whatever we have to face, he is there. And it is at this point that the ascension of Jesus has something to say about my health, my family, my grief, and my fears. As Lord and King he is not only right here with us as we strive to come to terms with all of the things that upset and cause us grief, but he also has the power to do something about it. He promised just before the ascension, "I will be with you always, to the end of the age" (Matt 28:20). He has promised to be our help and support when things are getting us down and we don’t have the strength within us to keep on going or are stressed at how everything will turn out. we are reminded that the ascended Jesus is far greater that any trouble that distresses us. When we give in to Satan’s tricks, when our sin upsets us, when our guilt plagues us, or we fear what will happen to us when we take our last breath, Jesus is our Lord and Saviour. He has defeated the power of sin to condemn us, he has beaten down Satan and has assured us that there is forgiveness for those many times we fall into his temptations. He has overcome the power of death and assured us that there is life after death and that he has prepared a wonderful place for us in heaven. Probably the earliest creed consisted of 2 words – Kyrios Iesous – Jesus is Lord. Jesus is Lord victorious over all the forces of evil that cause us hurt and injury. Jesus is Lord because he promises to walk with us always and to be our guiding and helping shepherd all the way through life. Jesus is Lord when it comes to our prayers. The Divine Creator stands by ready to assist, waiting for his children to request his all-powerful help. The ascended Jesus intercedes for us at God’s throne – he knows what it’s like to live through trouble and pain in this world. He understands what evil can do and answer our prayers in the best way possible for our blessing. secure in the knowledge that even if death should come Jesus has you in the palm of his hand? The Ascension reminds you and me that we have a Lord who came and gave his life for us. We are called to trust in the one who has defeated Satan and all evil. He will never leave us or abandon us. Yes there will be times when we will be overcome by evil, but we trust in the one who has already won the victory. He rules heaven and earth assuring us that in the face of any evil force, he is Lord. "I am certain that neither death nor life, neither angels nor other heavenly rulers or powers, neither the present nor the future, neither the world above nor the world below—there is nothing in all creation that will ever be able to separate us from the love of God which is ours through Christ Jesus our Lord." (Rom 8:38-39).